You are here: HomenextTopicsnextPrimitive Methodist HistorynextWere lay people ordained in the Primitive Methodist Church? Were lay people ordained in the Primitive Methodist Church? 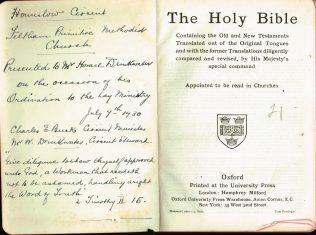 On 7 July 1930, a Bible was presented to Mr Horace Drinkwater, on the ‘Occasion of his Ordination to the Lay Ministry’, at Feltham Methodist Church, by the minister, Charles E Buck, and the Circuit Steward Mr W Drinkwater. What did ‘Ordination to Lay Ministry’ mean? An article in The Methodist Leader, 12 August 1926 (page 482), headed ‘Ordination of Lay Preachers’, provides the answer. A very interesting ordination service was held at Moriah Church, Bramley, Leeds, this being the second service of this kind held in this circuit during this year. The candidate for ordination was Mr C Edward Barker, a promising young man, who related his Christian experience and call to the work of preaching in an unaffected yet most effective manner. The charge was delivered by Rev W Daw. Mr W H Jagger, with whom Mr Barker came on to the Plan, gave the charge to the church. On behalf of the circuit, Mr T Appleyard, its oldest official, presented the candidate with an interlinear Bible. Mr Barker is the winner of the first Connexional prize for excellence in passing the Local Preachers’ Examinations in Group D, and the books which formed this prize were handed to him by Rev W Daw. The whole service was both inspiring and impressive. The ordination of Mr G C Williams and Mr G H Lamb to the full lay ministry took place on Sunday evening, July 25th, at Victoria Road Church, Aldershot. Rev A G Tanner conducted the service, assisted by Mr W Buxton. The former candidate is a son of Mr J H Williams, who has been connected with the Ash Road Church for many years and is still Trust Secretary of that church; and the latter is the son of Mr H Lamb, of Badshot Lea Church, and a local preacher of many years’ service. Having related their Christian experiences and call to preach, the charge to the candidates was given by Mr C H Winter, and the ordination prayer offered by Rev A G Tanner, the charge to the churches was delivered by Mr E J Stenner, Mr G C Miller presented Bibles, suitably inscribed, to the candidates on behalf of the circuit. On Tuesday, August 3rd, Mr Ernest Gardner was ordained as a local preacher at our New Herrington Church, Houghton-le-Spring Circuit. Mr W Gardner, the father of the candidate, presided over a large gathering and offered the introductory prayer. Rev H Fletcher read appropriate Scripture portions. Mr E Gardner feelingly related his Christian experience. He paid a high tribute to the influence of his parents and of his Church. After much thought he had responded to the urge to preach the Gospel, and he prayed he might be used of God. Mr A E Dawson gave the ordination charge, in which he impressed upon the candidate the necessity of maintaining a high conception of the dignity of the preacher’s office. Councillor J Fletcher, JP, offered the ordination prayer. 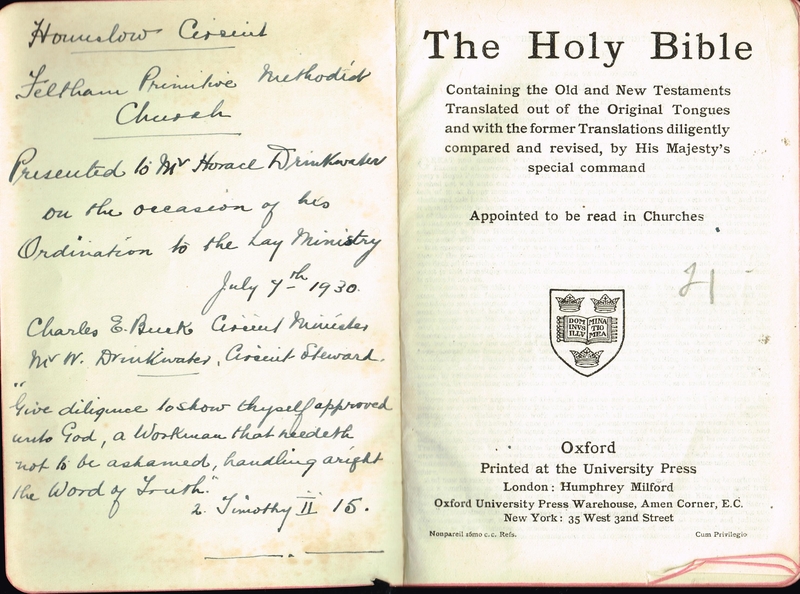 A copy of Dr Moffat’s translation of the Scriptures was presented to the candidate by Mr E Marshall. Rev H Fletcher addressed the church and spoke of the many ways in which the congregation could help the preacher. While expecting the best from the preacher, they must cultivate the lofty soul in the pew. What was a District Meeting like?